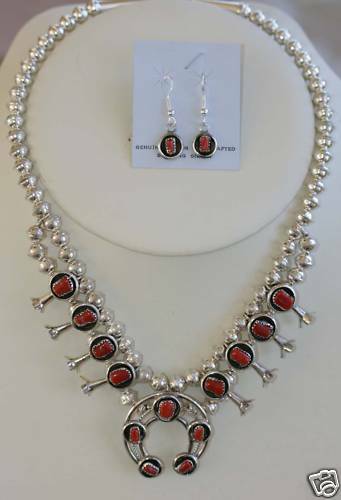 Navajo handmade Squash Blossom Necklace and Earrings by P Gene. It is made from sterling silver and coral. The total length is 18". The Naja measures 1 1/2". The smaller blossoms measure 1" by 1/2". The earrings measure 1 3/8" including the hook by 3/8". This item comes with a certificate of authenticity.